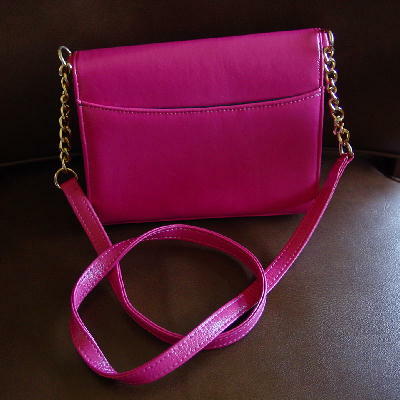 This hot pink Jennifer Moore purse is made of manmade materials. It has a black textured fabric lining and one interior zippered compartment. There is a snap closure on the front flap. 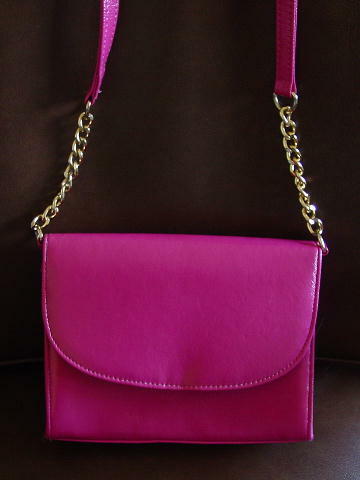 The hot pink 35 5/8" shoulder strap is attached to the purse by gold-tone chain links and a gold-tone circle. The back has an exterior open side to side (curved at the top) compartment. There is a faint blue ink mark on the upper part of the front flap. It's from a stylist's collection, and was used as wardrobe in a movie.